It was a sunny day and my lunch buddy and I headed to the Krema Nut Company to satisfy the insane urge we were sharing for a gourmet PB&J. 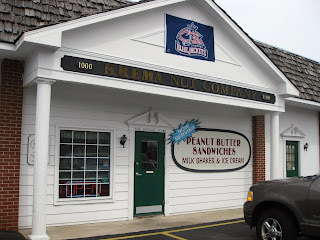 I have driven by Krema countless times in the years I have lived in Columbus. (Please note that I have lived in Columbus all of my life, however I do not feel it necessary to boldly state my age in print, thus giving certain people fodder for harassing me.) And every time I go by, I either say to myself or out loud, “Someday I wanna go there.” Well this was the day! Laura and I walked into the small storefront on Goodale Blvd. The main room is lined with shelves that cover the entire room. I kid you not! There is a desk in the corner and the checkout stand. Other than that it's shelves. And they are filled with bags of nuts, nuts and more nuts! Then you turn around and there are bags of all kinds of yummy candies, mixes & snacks, chocolate covered candies and nut butters. Oh my gosh. I was like a kid in a candy shop….umm, I was in a candy shop. Oh well, you know what I mean. It was awesome, dude and dudettes! There is a huge glass window behind the cashier counter that gives you a view of the factory. Unfortunately for us, we were not there at a time that they were making peanut butter. Bummer. In the smaller of the two rooms is the lunch counter. They have quite a menu of wonerous sandwiches. Business is strictly take-out. We were there at noon, and they were certainly doing a brisk business. Good for them, I say! They have a great menu, with lots of choices. 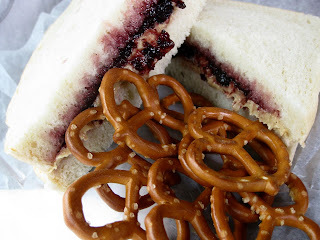 Factor in the “toppings” and you can create one heck of a PB&J. Laura decided to go with the “Buckeye”. 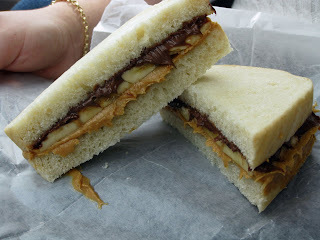 This is “Krema’s own freshly ground peanut butter with a layer of Nutella chocolate hazelnut spread.” She added sliced bananas for good measure. Sandwiches are made with your choice of white or wheat bread. Laura chose white. Well let me just say this about Laura’s sandwich: it was really, really good. I know this because I had a huge honkin’ bite. Oh man I wanted more, but it was her sandwich after all. Next time I’m getting the Buckeye with sliced bananas! I ordered the Krema Special. This is “Krema’s own ground peanut butter spread with a layer of strawberry preserves or grape jelly.” But I substituted Sarabeth’s mixed berry fruit spread. I requested white bread. By the way, the bread that they use is awesome. It reminds me of Great Harvest. (I guess it is possible that it is Great Harvest; I didn’t ask. My bad.) My sandwich was just a darn good PB&J. Classic. With a side of pretzels we were set. But no! Laura decides she’s going to crank it up a notch or two! She orders a PB&J milkshake. Strawberry. Holy cow! I’d never heard of a PB&J milkshake before. 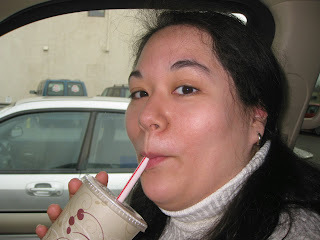 I was afraid that this milkshake might just be, how do I say it, weird? Well, I am so glad to that Laura lives life on the culinary edge. The gal behind the counter sure knows her stuff! Because she heard us saying that we were sharing the milkshake, she was even kind enough to split it into two cups. And it was really good. Not weird at all. 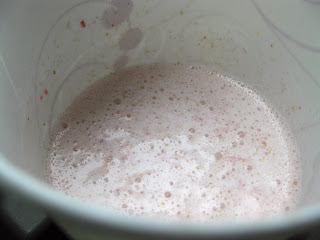 It was like a really good quality strawberry milkshake with just a hint of peanut butter. It went perfectly with our sandwiches. There is no place to sit and have lunch at the Krema Nut Company. So after paying for our lunch (and other assorted items that I won’t even go into here because I know I had no business buying that Three Chocolate Toffee) we just went back to my vehicle and had a “car picnic”. 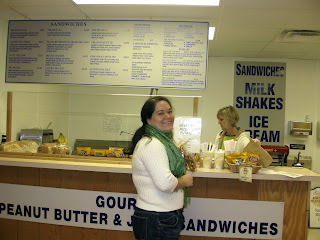 We relaxed with our freshly made sandwiches and "people watched" as the lunch time crowd came and went. What a great way to spend another Noon Time Travel.